The announcement follows a concerted effort by Auburn to elevate its commitment to life-saving research, beginning with an announcement by Auburn President Steven Leath in December 2017 and subsequent awarding of $5 million for three years toward the Presidential Awards for Interdisciplinary Research, or PAIR. An R1 designation by Carnegie is reserved for doctoral universities with the highest levels of research activity. Among 120 institutions to receive the R1 designation Monday, Auburn was listed in the top 100 of such universities, raising its classification from an already lofty “high research” R2 classification to Monday's “very high research activity” R1 label. “This tremendous designation acknowledges the hard work involved in the pioneering discoveries happening at Auburn every day,” said Leath, who was recently named one of seven new members appointed by President Trump to the National Science Board, a policy-making body of the National Science Foundation. “We are grateful to the university’s faculty and staff, especially Graduate School Dean George Flowers, for their unwavering commitment to elevating Auburn’s profile as a world-class academic institution. Universities considered for the R1 designation must have awarded at least 20 research/scholarship doctoral degrees and had at least $5 million in total research expenditures, according to Carnegie’s classification website. Auburn has grown its research efforts in both STEM and non-STEM areas, furthering its institutional commitment to offer solutions to real-world problems and grow its reputation as a go-to university in providing results that transform and inspire. Dr. Amal Kaddoumi, left, a professor in Auburn’s Department of Drug Discovery and Development, works in a lab with graduate research assistant Sweilem Al Rihani. Kaddoumi is leading a multi-disciplinary team in an investigation of oleocanthal, a molecule that appears naturally in extra-virgin olive oil, as a novel preventative treatment for such diseases as Alzheimer’s or dementia. In 1993, two Auburn University architecture professors, Dennis K. Ruth and Samuel Mockbee, established the Auburn University Rural Studio within the university's School of Architecture. The Rural Studio, conceived as a method to improve the living conditions in rural Alabama and to include hands-on experience in an architectural pedagogy, began designing and building homes that same fall. Professors Mockbee and Ruth sought funding to begin the studio, and through the years, it has received additional funding that has helped it become what it is today: a vision of a process to make housing and community projects in one of the poorest regions of the nation. To most, the measure of success of the Rural Studio is in its built projects; in reality, its success is measured by its effect upon the lives of the students, faculty, families, and communities it touches. It is not only the buildings that make the Rural Studio what it is, but also the education the students receive about architecture and about society. Ultimately, it is about "sharing the sweat" with the community. With the public kickoff of an ambitious $1 billion comprehensive campaign Saturday, April 18, 2015, (including announcement of the largest single gift in school history) Auburn University is delivering a renewed commitment to its students and faculty, a continued promise to the state of Alabama and a shared responsibility to the world. Auburn also announced it has raised more than $775 million to date in support of the “Because This is Auburn” campaign, the largest in Auburn’s history and one of the largest fundraising campaigns to date in the state. Before Saturday’s kickoff celebration at the A-Day football game, John and Rosemary Brown, both 1957 Auburn graduates, committed to Auburn $57 million, the largest gift in school history. The gift will fund two major new facilities: a new performing arts center and a student achievement center in the Samuel Ginn College of Engineering. John W. Brown was CEO and chairman of the board of Stryker Corporation, a leading medical device company with annual revenue exceeding $9 billion. Rosemary K. Brown retired after serving as a mathematics teacher for almost 30 years. She has served on many community boards, including the Freed Hardeman University and Kalamazoo College Board of Directors, the Kalamazoo Symphony Orchestra Board, the Kalamazoo Institute of Arts Board and currently the Atlanta Opera Board. John serves on the boards of St. Jude Medical, the American Business Conference and the Auburn University Foundation. He is an inductee in the State of Alabama Engineering Hall of Fame, a recipient of the Auburn Alumni Association’s Lifetime Achievement Award, a recipient of an honorary law degree from both Freed Hardeman University and Kalamazoo College, the inaugural recipient of the AdvaMed Lifetime Achievement Award and will be the inaugural inductee into Auburn University’s Entrepreneur Hall of Fame hosted by the Raymond J. Harbert College of Business. •Joe and Gayle Forehand, residents of Dallas, Texas, are members of Auburn’s 1856 Society and Petrie Society, as well as the Samuel Ginn College of Engineering’s Ginn Society and Eagle Society. Gayle is a 1970 business administration graduate of Auburn’s Raymond J. Harbert College of Business and served previously as chief accountant at Emory University and assistant controller at Emory University Clinic in Atlanta. Joe, who earned a degree in industrial engineering from Auburn’s Samuel Ginn College of Engineering in 1971, is the former chair and CEO of Accenture and currently serves as a director on the Auburn University Foundation Board of Directors. •Raymond and Kathryn Harbert, residents of Birmingham, are members of Auburn’s 1856 Society, James E. Foy Loyalty Society and Heisman Society. Kathryn is a 1981 public administration graduate of the College of Liberal Arts and currently serves on the boards of directors of the Alabama Department of Archives and History and several community nonprofit organizations. Raymond, who earned a degree in 1982 from the Raymond J. Harbert College of Business, is chairman and CEO of Harbert Management Corporation, as well as a current member and immediate past president pro tem of the Auburn University Board of Trustees. •Wayne and Cheryl Smith, residents of Nashville, Tennessee, are members of Auburn’s 1856 Society and James E. Foy Loyalty Society, as well as the College of Education’s 1915 Society and Patrons of the Kesytone/Dean’s Circle. Both College of Education graduates, Cheryl earned a degree in education in 1968. Wayne, who earned a bachelor’s degree in physical education in 1968 and a master’s degree in school administration in 1969, is chairman, president and CEO of Community Health Systems, as well as a member of the Auburn University Board of Trustees. •Beth Thorne Stukes, who resides in Jasper, Alabama, is a member of Auburn’s 1856 Society and James E. Foy Loyalty Society, as well as the Woodlands and Wildlife Society in the School of Forestry and Wildlife Sciences. After attending Auburn University in the 1980s, she completed a bachelor’s degree in education at the University of Alabama at Birmingham in 1988. She chairs the College of Human Sciences’ Campaign Committee and serves as an Executive Committee member of its Women’s Philanthropy Board. The “Because This is Auburn” campaign will support four major areas across the university. Auburn’s goal is to create thousands of new scholarships for students, to endow more than 100 new chairs and professorships for educators and researchers, to develop programs that will allow the Auburn Family to connect with people everywhere, and to build new facilities and re-imagine existing campus facilities. Opportunities to support research include the LAUNCH Fund for Research Innovation at Auburn University. LAUNCH is designed to accelerate the best research and ideas into real products in the marketplace. LAUNCH is for innovative research projects that are likely to impact the regional economy and workforce development. It’s for projects that hold promise for generating additional sources of revenue for Auburn, with the goal of reinvesting those revenues to expand additional research efforts, year after year. One Tiger Cage judge boasts a net worth in excess of $400 million and the experience of being an original "Shark Tank" panelist. Three others are successful venture capitalists. No pressure, young entrepreneurs. Two seniors in mechanical engineering impressed the group so much with their concept of a parking management system utilizing sensors and cloud-based data management that they walked away with a $10,000 grand prize in the first Tiger Cage student entrepreneurship final round on Friday, April 24. Jonathan Philip, of Madison, Alabama, and Alex Wakefield, of Huntsville, Alabama, created and pitched "Parking Grid Technologies," app-based software that alerts commuters to available parking spots on-demand, in a competition that began in October with 20 teams and ended with four finalists at The Hotel at Auburn University and Dixon Conference Center. Philip and Wakefield also walked away with $30,000 in legal funding from the Silicon Valley-based law firm of Wilson, Sonsini, Goodrich & Rosati. Hosted by the Raymond J. Harbert College of Business in partnership with the Auburn Research and Technology Foundation, Tiger Cage rewards the best early-stage products, business concepts or services that emerge from student entrepreneurs. The panel of industry professional judges included Kevin Harrington, original panelist from ABC's "Shark Tank" and pioneer of the "As Seen on TV" product line, who made Ginsu Knives and exercise mogul Tony Little household names. Finalists were given 15 minutes to pitch their ideas – showing viability and estimated market demand for the products. Winners were announced that evening at the Auburn University Entrepreneur Hall of Fame Gala, a black-tie event capping the inaugural Entrepreneurship Summit hosted by the Raymond J. Harbert College of Business. - Fourth place ($1,000): BAUCE, a social media application created by Hunter Barriault (Business Administration) and Brett Townsend (Engineering). "They (Parking Grid Technologies) showed us a good amount of clarity – they understood their market and the financial aspect of the business," said Scott Kupor, COO of Andreessen Horowitz, a Silicon Valley-based venture capital firm, and one of six final round judges. "They made a strong presentation and they showed a need (for the product)." Other final round judges included Paul McCreadie, director of Michigan-based capital firm Arboretum Ventures; Chris McCulley, founder and CEO of robotics manufacturer Deshazo Automation; Will Brooke, senior partner for Harbert Management Corporation Venture Capital; and LaKami Baker, managing director of the Lowder Center for Family Business and Entrepreneurship. "They were all very polished and it was obvious that they had done a great job of preparing," noted Harrington. John Mason, Auburn University vice president for research and economic development and president of the Auburn Research and Technology Foundation, relishes the role of Auburn as leader in entrepreneurship. "Auburn University is focused on enhancing its economic development role for the state of Alabama through entrepreneurship, innovation and the commercialization of our intellectual property," he said. John Weete, executive director of the Auburn Research and Technology Foundation, added, "The ARTF is very pleased to work with the Harbert College in promoting entrepreneurship among Auburn University students and providing one year of free space in the Auburn Business Incubator to the winner." Moments after learning the judges' decision, Wakefield called the win "euphoric." Philip considered it "surreal." "It's been a very rough road to get here. We put a lot of hard work into it," said Wakefield, who is earning a minor in Business-Engineering-Technology. "We're both doing 18-hour semesters in engineering and it's not been an easy task to balance this at the same time. I feel so humbled and blessed. It's not anything that I could have done without the help from (teammate) J.P."
Teams were mentored through the competition by industry professionals from a variety of disciplines. "That's been so beneficial, this whole process," added Philip, who is also earning a B-E-T minor. "The mentorship was a huge aspect that was crucial to this. Like what (Delphinus Medical Technologies CEO and student mentor) Mark Forchette said, 'If it's just a business competition it's a failure.' Putting the mentorship part in was a game-changer in this. I know Alex and I benefited so much from that." As 200 gala attendees applauded the winners, one man stood in the back of the room and fought back tears. Steve Wakefield, senior vice president of IT at Cenveo in Stanford, Conn., and Auburn chemical engineering alum (1985), was on business Thursday in New York City. By Friday morning, he had flown to Auburn and surprised his son before the Tiger Cage final round. "It was her idea," Steve said, pointing at Sara Wakefield, Alex's wife and senior in kinesiology at Auburn. "She asked if I could come support him and surprise him." Sara Wakefield said the father's surprise, "meant the world to Alex." "He's always looked up to his dad," she said. "Both are engineers. It was an honor to have his dad come and support him and start his own company — just like his dad." Steve Wakefield, who started a consulting company in Huntsville when Alex was six weeks old, simply said, "A father couldn't be more proud." - Second place ($1,500): Tennibot, formerly the Hobot, a robotic device that tracks and scoops tennis balls developed by Haitham Eletrabi, Shane Tucker, Mondather Suliman and Xuemei Yuan. Auburn University's new RFID Lab held its grand opening Wednesday, during which Amazon announced a joint project with Auburn to explore the business case for the implementation of RFID within the Amazon supply chain. At the event, Dave Clark, Amazon's senior vice president of worldwide operations, said, "RFID is a fascinating technology. As part of this joint project, we are excited to invent new processes and technology using RFID to enhance the experience for customers through better inventory predictability, faster delivery and, ultimately, lower cost. The collaboration presents a unique opportunity for students, faculty and industry to come together in a hands-on and fast-moving real world environment." Auburn University's RFID Lab specializes in the business case and technical implementation of radio frequency identification technology in retail, supply chain and manufacturing settings. The lab draws on the expertise of faculty in Auburn University's Raymond J. Harbert College of Business, Samuel Ginn College of Engineering, College of Human Sciences and College of Agriculture. In moving to Auburn University in 2014, the lab was reunited with its founder, Harbert College of Business Dean Bill Hardgrave. Hardgrave helped launch the lab at the University of Arkansas in 2005. Even though its location has changed, the lab has continued to work with leading retail, supply chain, manufacturing and technology companies. "As the RFID industry expands, it's important to have as many users engaged in the lab as possible as lessons from one industry often hold true for others," Auburn University RFID Lab Director Justin Patton said. "Having unique retail partners like Amazon engaged in the lab allows us to focus on the research questions that are most crucial to many different users, and add the academic validation that helps bring maturity to the evolving market." Amazon has utilized RFID technology in its fulfillment centers, the massive facilities where customer orders are picked from shelves, moved on conveyers and loaded onto trucks for rapid shipping and delivery. Founded in 1994 and based in Seattle, the company's footprint includes more than 100 fulfillment centers worldwide. Located in a former supermarket, the 13,000-square foot Auburn University RFID Lab offers simulated retail, grocery and convenience store space, as well as warehouse and distribution center environments. The Auburn University RFID Lab established the first RFID "tagged item certification program" to assist retail product manufacturers. RFID technology utilizes computer chips smaller than a grain of sand to aid in the wireless tracking of items. Researchers from the Auburn University Research Initiative in Cancer, or AURIC, and Nuovo Biologics LLC, of Davie, Florida, have announced a partnership to develop new therapies for cancer. Initially targeting canine malignant melanoma, or skin cancer, a deadly tumor that affects many dogs, the team will be testing Nuovo’s innovative anti-cancer peptide drug MMX for its ability to treat these tumors. The National Institutes for Health recently awarded a grant funded by the U.S. Food and Drug Administration to support a clinical trial of the new peptide treatment. According to Dr. Bruce Smith, director of AURIC and leader of the Auburn component of the research effort, the clinical trial will begin to recruit patients as early as June or July. In addition to the planned research with Nuovo, AURIC scientists are pursuing a wide variety of interdisciplinary cancer research, ranging from identifying the basic mechanisms that make normal cells become cancerous to a variety of new approaches to treating cancers. Funding for AURIC research is provided by the state of Alabama, federal research grants, funding from private organizations and donations from individuals. Both AURIC and Nuovo Biologics take a One Health/One Medicine approach to cancer treatment, allowing discoveries in one species to be translated to other species. This latest partnership builds on the collaborative approach Nuovo has implemented with academic institutions, researchers and veterinarians across the country. Founded in 2010, Nuovo Biologics is focused on developing a unique set of therapeutic protein drugs. Extensive in-vitro and animal model studies have shown these new peptide drugs to be promising in the oncology sphere, but also to have broad anti-viral application. Nuovo’s business model leverages strong collaborations to test animal products, which serve as models for the human market moving forward. For more information about Nuovo Biologics, go to http://www.nuovobiologics.com/. On May 1, 2015, Dr. Robert Norton, professor and director of the Auburn Univeristy Open Source Intelligence Laboratory received the prestigious Knowlton Award from the Military Corps Association (MICA) for his support of the Military Intelligence Corps. The Knowlton Award recognizes individuals who have contributed significantly to the promotion of Army Intelligence in ways that stand out in the eyes of the recipients, their superiors, subordinates, and peers. These individuals demonstrate the highest standards of integrity and moral character, display an outstanding degree of professional competence, and serve the Military Intelligence Corps with distinction. Todd May, a 1990 alumnus of Auburn University in materials engineering, has been named deputy director of NASA's Marshall Space Flight Center in Huntsville, Alabama. He will help manage the center's nearly 6,000 civil service and contractor employees and $2.5 billion annual budget. Since 2011, May served as manager of the Space Launch System, a new large rocket that replaces the space shuttle to take astronauts and probes into space. The rocket is one of NASA's top three priority projects, with May overseeing its development at Marshall through its in-depth critical design review in July. Previously, May managed the agency's robotic lunar program including the successful launch of two lunar probes in 2009. 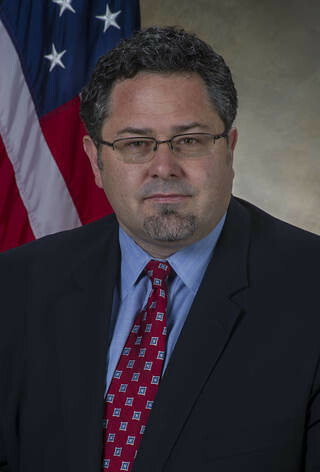 He also served as deputy associate administrator in the Science Mission Directorate at NASA headquarters in Washington, D.C., as well as the deputy manager of Marshall's Science and Mission Systems Office in a dual role as associate program manager of the Constellation Program, which looks to reenergize NASA human spaceflight efforts. May has been honored with NASA's Exceptional Achievement Medal and Leadership Medal, the Presidential Rank Award of Meritorious Executive and the John W. Hager Award for professionalism in materials engineering. In 2014, he received Aviation Week's Program Excellence Award. May was named the Distinguished Auburn Engineer by Auburn's Samuel Ginn College of Engineering in 2012 and received the college's Outstanding Auburn Engineer Award in 2010. May and his wife, Kelly, have four children and reside in Huntsville, Alabama. Auburn University has been selected to lead a national manufacturing effort on harsh environment electronics as part of a U.S. Department of Defense led flexible hybrid electronics institute. On Friday, Aug. 28, at NASA's Ames Research Center, Department of Defense Secretary Ashton Carter announced a cooperative agreement to the research consortium FlexTech Alliance to establish and manage a Manufacturing Innovation Institute for Flexible Hybrid Electronics, or FHE MII. FlexTech Alliance, based in San Jose, California, will coordinate the FHE MII, which comprises 96 companies, 11 laboratories and non-profits, 43 universities and 15 state and regional organizations. Auburn University will head the only node in the state of Alabama. Leading Auburn's node on harsh environments is Pradeep Lall, the John and Anne MacFarlane endowed professor of mechanical engineering and director of Auburn's NSF Center for Advanced Vehicle and Extreme Environment Electronics, or CAVE. "This establishment will provide engineers with the integrated skills and theoretical background for the manufacture of flexible hybrid electronics for extreme environment applications," said Lall. "It will create intellectual property and expenditures on research, education and related activities, as well as catalyze development of technologies which can be manufactured in the state. We have developed strategic partnerships with industry and research labs in Alabama and nationally for development and demonstration of technologies for harsh environment operation." The institute will be awarded $75 million in federal funding over a five-year period and is being matched by more than $96 million in cost sharing from non-federal sources including private companies, universities, not-for-profit organizations and several states, including Alabama. "The strength of the institute will stem from the strong support and previous work of our partner organizations," said Michael Ciesinski, CEO of FlexTech Alliance. "Auburn University's strong work in utilizing electronics in harsh environments will lend the institute a huge advantage in the special needs for that environment. We look forward to collaborating with the excellent team there and the CAVE facility." In addition to defense, the institute's activities will benefit a wide range of markets including automotive, communications, consumer electronics, medical devices, health care, transportation and logistics and agriculture. "I am pleased that Auburn University is a partner in this national organization, and that Dr. Lall is leading the way for its initiatives on harsh environments," said Christopher B. Roberts, dean of the Samuel Ginn College of Engineering. "The institute represents an innovative collaboration between the public and private sectors and has the potential to make a huge impact on our nation as we continue to embrace advanced manufacturing." The new institute is part of the National Network for Manufacturing Innovation program. The FHE MII is the seventh manufacturing innovation institute announced and the fifth under Department of Defense management. The institutes are intended to bridge the gap between applied research and large-scale product manufacturing, and it is anticipated that Auburn's harsh environment node will create technologies for the benefit of the nation's commercial and national defense interests. Auburn University Research Advisory Board Member, Dr. Paul Lioy, passes away. It is with profound sadness that we share the news of the sudden passing of dedicated Research Advisory Board member, Paul Lioy on Wednesday, July 8, 2015. Dr. Lioy was an active member of the Research Advisory Board and a strong advocate for Auburn Research. Dr. Lioy was Professor and Vice Chair of the Department of Environmental Medicine at the Robert Wood Johnson Medical School of Rutgers University. As many of you in the university community may know, Dr. Lioy was a pioneer in air pollution research and was one of the first scientists to take samples from Ground Zero after the Twin Towers collapsed. He was considered one of the world's leading experts in personal exposures to toxins and was elected a fellow at the Collegium Ramazzini Environmental and Occupational Medicine and Health, Carpi, Italy, in 1999. Since 2002 Dr. Lioy was one of Information Sciences Institute's most highly cited scientists in the category of environment and ecology. He was the recipient of numerous national and international awards, including the International Society of Exposure Science Jerome Weslowski Award for Lifetime Achievement and the Ellen Hardin Walworth Medal for Patriotism. Among the many books he authored, he was the most proud of "Dust: The Inside Story of its Role in the September 11th Aftermath." The thoughts and prayers of the Auburn Family are with Dr. Lioy's family and friends at this difficult time. Auburn University mechanical engineering professor Pradeep Lall has received a top National Science Foundation award for his work as director of Auburn's Center for Advanced Vehicle and Extreme Environment Electronics, or CAVE3. His research includes developing methods for protecting electronics in harsh environments. Lall, the John and Anne MacFarlane Endowed Professor in Auburn's Department of Mechanical Engineering, was recently awarded the 2016 Alexander Schwarzkopf Prize for Technological Innovation from the National Science Foundation's Industry/University Cooperative Research Centers program. 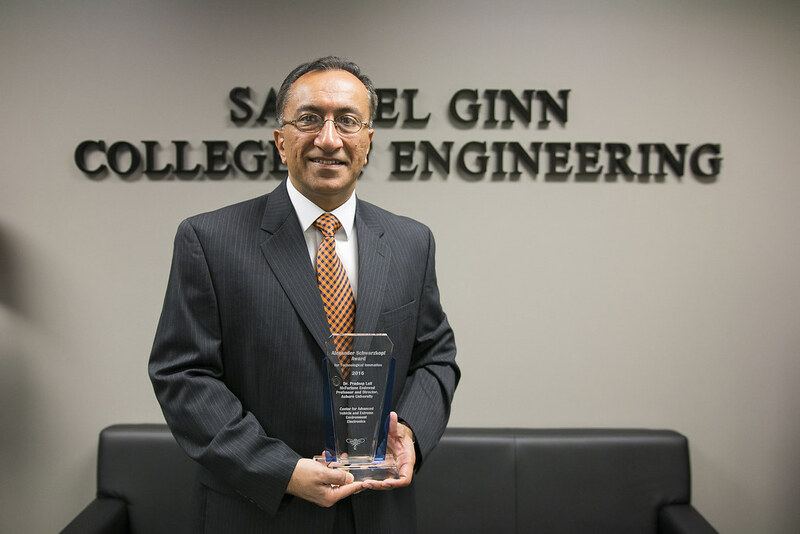 "This award is reaffirmation of Dr. Lall's national reputation and recognition of his seminal contributions to the field of mechanical engineering," said Christopher Roberts, dean of the Samuel Ginn College of Engineering. "His work has positioned Auburn Engineering to be a leader in harsh environment electronics research as we address the challenges in this exciting field." Corrosive attack of salt fog for electronics operating on ships at sea. "Electronic systems have taken an increasingly important role in automotive design and operation," Lall said. "Traditional automotive electronics at one time consisted of climate control and entertainment systems. Roll the clock forward to the present day and automotive electronics have expanded to include driving assists such as antilock braking systems, traction control systems, adaptive cruise control, lane departure warning systems and more. Failure of one of these systems is no longer an inconvenience; it may be critical to the safe operation of the vehicle." Founded in 1999 as the Center for Advanced Vehicle Electronics, CAVE3 has over the years expanded its expertise to include extreme environment electronics. Lall has been the center's director since 2008, following his appointment as associate director in 2004. Lall also directs Auburn's Harsh Environments Node of the NextFlex Manufacturing Institute, part of a national manufacturing effort on harsh environment electronics led by the U.S. Department of Defense. CAVE3 partners with industry, government and academic agencies to address major technological challenges through precompetitive research on automotive and harsh environment electronics. This arrangement gives the center an opportunity to address the challenges before the technologies become commercialized. 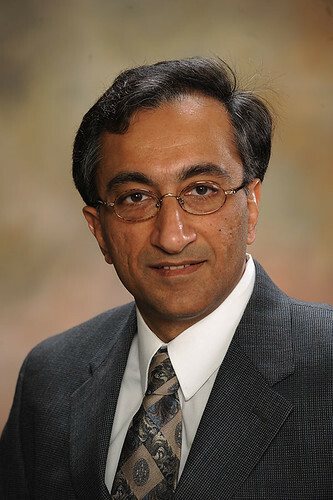 Lall joined the Auburn faculty in 2002 after a distinguished industry career at Motorola, where he worked on the development and manufacture of wireless products such as cellphones and two-way radios. "Dr. Lall's recognition with the Alex Schwarzkopf Prize is evidence of the societal and transformational impact that Auburn University is making on automotive and harsh environment technologies in everyday life," said John Mason, Auburn's vice president for research and economic development. The National Science Foundation's cooperative research centers program was established in 1973 by Schwarzkopf to develop long-term research partnerships among industry, academe and government in areas of mutual interest. The Alexander Schwarzkopf Prize for Technological Innovation has been presented annually since 2003 to an individual or team at a member institution whose research makes an exemplary contribution to technology innovation. More than 100 universities and nearly a thousand researchers are members. Auburn University and NASA today signed a Space Act Agreement to explore and advance the applications of additive manufacturing, or 3-D printing. The signing took place during the university’s forum on additive manufacturing, a process that uses 3-D printing to make a three-dimensional part or instrument, providing substantial technological advances and cost savings over traditional manufacturing methods. The forum was co-sponsored by Auburn University and the City of Auburn Industrial Development Board. The Space Act Agreement, in addition to focusing on additive manufacturing, is designed to advance STEM disciplines – science, technology, engineering and mathematics – by engaging students and teachers in NASA’s missions and opportunities; investigate and develop technologies; and share facilities, capabilities and technical expertise. The Marshall Center has used additive manufacturing to build and test rocket engine components and manufacture the first 3-D printed parts aboard the International Space Station. These parts are currently undergoing testing at Marshall. Auburn’s forum, “Additive Manufacturing, the Next Industrial Revolution,” brought together leaders from the private sector, academia and government to explore opportunities and challenges of using this advanced technology in manufacturing. Greg Morris, general manager of additive technologies with GE Aviation in Cincinnati, gave the keynote address. GE Aviation is bringing high-volume additive manufacturing to its facility in the city of Auburn to manufacture jet engine fuel nozzles. Elite athletes from across the nation can now train and receive science-based assessments and personalized feedback from kinesiology experts at Auburn. 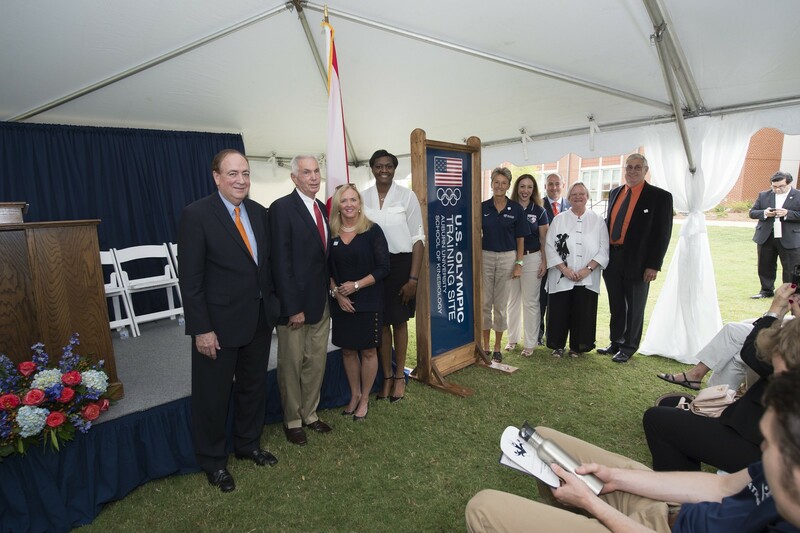 The College of Education unveiled signage on Sept. 25 marking Auburn University's official designation as a U.S. Olympic training site by the United States Olympic Committee, or USOC, following a ceremony at the School of Kinesiology. Auburn is one of 18 Olympic training sites in the country and one of only five universities nationwide to receive the designation. The Kinesiology Building, Beard-Eaves-Memorial Coliseum and Watson Fieldhouse were designated U.S. Olympic training sites as the university assists Team USA on its journey to the 2016 Rio de Janiero Olympic Games. "USA Team Handball is one that competes at the highest level in the Pan American Games and Olympic Games," said retired Brig. Gen. Harvey Schiller, president of USA Team Handball and USOC representative. "I think it's a unique opportunity for the community and the university to have an Olympic sport housed in its environment." The ceremony, which was hosted in conjunction with the College of Education's centennial anniversary celebration and the Auburn University Board of Trustees' quarterly meeting, included remarks from Jay Gogue, Auburn University president; Betty Lou Whitford, dean of the College of Education; David Benedict, chief operating officer for Auburn University Athletics; Schiller; Sarah Gascon, doctoral candidate in the School of Kinesiology; Sarah Newton, member of the Auburn University Board of Trustees; and Dave Pascoe, a Humana-Germany-Sherman Distinguished Professor and the assistant director of the School of Kinesiology. Administrators from the university and USA Team Handball, along with several athletes were also honored on Sept. 26 before the Auburn vs. Mississippi State football game. "This designation brings together the recognizable logos of the USOC, Auburn University and USA Team Handball," said Pascoe. "People across the country will want to connect with this unique collaboration of spirit, science and top training facilities." Since the summer of 2013, Auburn has hosted elite training and competition for the men's and women's USA national team handball programs. The USA Team Handball members are also a part of a long-term residency program at Auburn through the School of Kinesiology. This program allows the school to provide expertise in assessment and performance of human movement, including biomechanics, basic and applied physiology, neuroscience, behavior, conditioning, health and motor learning and development. "The Auburn School of Kinesiology has been instrumental in providing a new home for USA Team Handball athletes and we appreciate the support of the Auburn-Opelika community in welcoming our athletes and coaches," said Alicia McConnell, USOC director of training sites and community partnerships. "We look forward to a fruitful relationship with Auburn University as an official U.S. Olympic training site." For more information about the United States Olympic Committee, go to www.teamusa.org. For more information about USA Team Handball, go to www.teamusa.org/USA-Team-Handball. Auburn University has won a top national Innovation and Economic Prosperity University award for its impact in economic development, announced today by the Association of Public and Land-grant Universities, or APLU. Auburn received the honor in the “place” category. The “place” award recognizes Auburn for excelling in community, social and cultural development work. Auburn’s application for the award highlighted three programs: the Auburn University Rural Studio, the National Poultry Technology Center and the off-bottom oyster farming initiative at the Auburn University Shellfish Lab. “Understanding local culture and social norms, workforce needs and public priorities is critical to providing communities with tools needed to prosper,” Mason said. The Auburn University Shellfish Laboratory on the Dauphin Island provides instruction, research and outreach in the area of shellfish ecology and production. Through their efforts, a 32-acre oyster farm “business park” along with hands-on training programs where participants establish commercial oyster farms on site has been established in Portersville Bay, Alabama. Auburn had an overall $5.1 billion economic impact on the state economy in 2014 and created 23,600 jobs, in addition to direct employment, according to a recent self-study. The sequencing of the channel catfish genome—considered one of the major milestones in the annals of Auburn University research—has been detailed in an article published in the June 2 issue of Nature Communications, an international multidisciplinary journal. “This project represents eight years of work, with the collaboration of more than 50 scientists,” said Zhanjiang (John) Liu, associate provost and associate vice president for research at Auburn University and professor in the College of Agriculture’s School of Fisheries, Aquaculture and Aquatic Sciences. The project is significant for many reasons, Liu said, including the sheer magnitude of the work. “It is the first catfish genome sequence in the world, and the catfish has approximately 4,100 species,” he said. The research also is a good model of university and government collaboration, with Auburn leading the project and significant contributions from USDA-ARS in Mississippi, he said. It also allows scientists who work with catfish to focus their research in other areas and rely on the DNA map provided by the project as a primary resource. “This resource is now available by simply searching the GenBank, and that saves a tremendous amount of labor for scientists,” said Liu, who has led the catfish genome sequencing project since its inception. The research actually included the sequencing of three fish genomes—a channel catfish and two South American scaled catfish species. The project is important to the future economic health of the U.S. catfish industry because every trait is controlled by the genome, he said. Top-performing breeds are essential, he said, if the catfish industry in Alabama and nationwide is to remain economically viable in the face of soaring feed, energy and fuels costs, low farm-gate prices and increased competition from overseas imports. Genetics, Liu said, is the most important element in fish production. Applying genome mapping to the catfish breeding process is very close to becoming a reality, he said. He believes genome mapping will enable the breeding of a “super fish” that will possess the most desirable traits. “It requires a lot of collaboration between the research community and the industry, but if we all work together, we’ll see major progress toward the practical application of this research in the next three to five years,” Liu said. While work is completed for the genome sequencing of the channel catfish, it continues on the blue catfish. Top-performing breeds are essential if the catfish industry in Alabama and nationwide is to remain economically viable in the face of soaring feed, energy and fuels costs, low farm-gate prices and increased competition from overseas imports. By John M. Mason Jr., vice president for research and economic development at Auburn University and president of the Auburn Research and Technology Foundation. The state of Alabama has welcomed and benefited from new industries over the decades and now looks forward to the knowledge-based economy of tomorrow. To maximize our potential, it's incumbent that we invest in our workforce and nurture government, business and industry partnerships, especially those in sectors building upon advanced technologies and new ideas. For many years, state and local economic development programs relied on offering tax breaks and other incentives in a sort of arms race to see who could give the most generous package. While financial incentives have their place, our future as local communities and as a state rests on enhancing investments in three economic pillars--a trained workforce, new technologies and entrepreneurship-- as the recipe for a sustained, secure and prosperous future. The immense ability of our state's educational institutions to provide impactful research and a workforce able to fulfill the promise of next-generation technologies is undeniable and appealing, nationally and globally. More strategically focused partnerships among four-year universities and the Alabama Community College System will ensure we can supply high-tech companies with a talented workforce. Technical institutes offering credentialing and certificate programs in partnership with higher education represent another avenue. For example, the Auburn Research and Technology Foundation is working with the City of Auburn, Auburn University, the Alabama Community College System and commercial partners on creating technology credentialing, training and research and development in emerging manufacturing technologies, advanced computer numeric control operations and tool and die design. The goal is an advanced workforce capable of meeting the increasing technological needs of current industries in the state and others considering locating here where industry startup training is an attractive incentive. Bringing more industry and training to all parts of Alabama will help communities move forward. An educated, highly capable workforce will propel our efforts to attract knowledge-based industries and enhance those already in the state. Our nation is looking for next-generation technologies in areas like sensitive cyber security, additive manufacturing, health sciences, military defense, agriculture and bioscience systems, robotics and radio frequency identification. Knowledge-based industries in these associated fields represent the type of companies that will stay in the U.S. to better protect their respective proprietary and intellectual property. An excellent tool for recruiting industries of the future and expanding existing ones is the Alabama Science and Technology Roadmap, developed as part of Accelerate Alabama 2.0, which updates the state's strategic economic development growth plans. It identifies science and technology capabilities at Alabama universities and research institutes and matches this expertise to targeted business sectors. This will help enhance and expand Alabama's infrastructure and resources needed to ensure the state is nationally and internationally competitive. Auburn, like many state institutions, focuses on knowledge-based technologies. We collaborate with partners such as GE Aviation, which brought high-volume additive manufacturing to its facility in the City of Auburn, and the HudsonAlpha Institute for Biotechnology in Huntsville, working with our College of Veterinary Medicine and others to identify genes associated with cancer, cardiovascular diseases and obesity. On campus, our Samuel Ginn College of Engineering is tasked with helping protect the cyber security of our nation's infrastructure through the Charles D. McCrary Institute, founded through an Alabama Power Foundation donation in honor of its former CEO and an Auburn alumnus. Supporting an idea that seemed far-fetched a few years ago could lead to an industry of the future. A community will thrive with entrepreneurs and a collection of small, knowledge-based companies, each with 25 to 100 well-paying jobs. An exemplary program is Alabama Launchpad, part of the Economic Development Partnership of Alabama, that promotes and rewards high-growth, innovative startup companies from across Alabama. The competition is for startups that need additional capital to launch their business as they compete for cash grants. At Auburn we have created LAUNCH to help faculty bridge the gap between innovative research and the marketplace. One project that could impact the healthcare industry involves the production of antimicrobial wound dressings with the hope of reducing the occurrence of dangerous infections and enhancing wound healing. This spring, our Raymond J. Harbert College of Business will host its third annual Entrepreneur Summit March 30-31 featuring the Tiger Cage competition, similar to ABC's popular "Shark Tank" show, for student entrepreneurs. Providing more opportunities at the state and local levels will help attract and empower startup companies. Auburn and its partners work diligently to strategically position our community and state for growth in the knowledge-based economy of tomorrow. Our local partnership received accolades in a recent Wall Street Journal article spotlighting college towns and their economic resilience to overcome job losses from vanishing industries and overseas competition. Collaboration on knowledge-based technologies among four-year universities, community colleges, government officials, local authorities and industry partners will usher in the next phase of economic growth and innovation in Alabama. At the beginning of July, the Innovation and Economic Prosperity Universities Program, part of the Association of Public and Land-Grant Universities, created an IEP Case Study Library that allows interested parties to learn about and from designee economic development projects provided in awards submissions. As both a designee and an award winner in the "Place" category, Auburn University's case studies are currently featured there. Case studies include information on the Rural Studio, the National Poultry Technology Center, and the Off-Bottom Oyster Farming efforts at the Auburn University Shellfish Lab. To learn more, visit the IEP Case Study Library. An Auburn University professor says human-induced methane and nitrous oxide gas emissions overwhelm terrestrial carbon dioxide uptake—contributing to climate change—and thus should be reduced to alleviate the problem, according to a study published in the March 10 issue of the scientific journal, Nature. Hanqin Tian, director of the International Center for Climate and Global Change Research in Auburn's School of Forestry and Wildlife Sciences, is the lead author of "The terrestrial biosphere as a net source of greenhouse gases to the atmosphere." 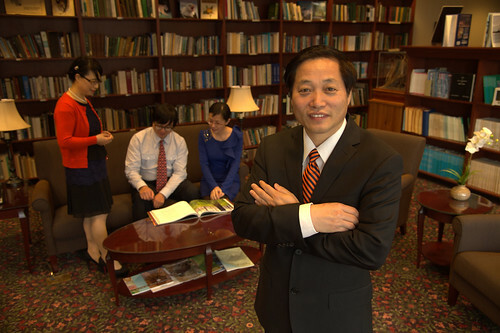 His Auburn colleagues, Assistant Professor Shufen Pan, research fellow Jia Yang, graduate student Bowen Zhang and former research fellow Chaoqun Lu, now an assistant professor at Iowa State University, served as co-authors among an international research team of 23 scientists from 16 institutions in four countries. Nature is widely regarded as the world's most highly cited interdisciplinary science journal. "This study for the first time, to the best of our knowledge, examined the net balance of three major greenhouse gases of carbon dioxide, methane and nitrous oxide in the land biosphere and the contribution of human activities during the past three decades," said Tian, who serves as the Solon and Martha Dixon Professor and Alumni Professor at Auburn. The terrestrial biosphere plays a critical role in the global carbon cycle and is commonly recognized as a carbon sink, which means to sequester atmospheric carbon dioxide and hence mitigate climate change. But the human transformation of the land biosphere also caused a large amount of methane and nitrous oxide emissions. From both science and climate policy perspectives, he says it is of critical important to concurrently estimate the overall balance of the three major greenhouse gases in the land biosphere. "The global warming potential of methane and nitrous oxide are 28 and 265 times larger than that of carbon dioxide, respectively," Tian said. "We analyzed and synthesized the state-of-the-art estimates of biogenic fluxes of these three gases at global and regional scales to better understand the climate-ecosystem feedback and effectively mitigate climate change. The net balance of human-induced greenhouse gases could to some extent reflect the role of the land biosphere in shaping the climate system." The researchers found that the cumulative warming capacity of concurrent methane and nitrous oxide emissions is a factor of about two times larger than the cooling effect of the global land carbon dioxide uptake, based on the global warming potential on a 100-year time horizon. "This finding reveals for the first time that human activities have transformed the land biosphere to act as a contributor to climate change," Tian said. The study also finds that human-caused biogenic fluxes of these gases in Southern Asia, a region including China and India, led to a larger net climate warming effect, compared to other regions. A major source of human-caused methane emission comes from rice cultivation and livestock, while a major source of nitrous oxide is from the use of manmade fertilizers. Co-author Anna Michalak of Carnegie Institution for Science in Stanford, California, said, "Here we bring together information from dozens of sources to show that human actions, on a global scale, have caused the world's plants, animals and microbes to contribute to global warming." Tian added, "We suggest that adoption of best practices by policymakers and landowners to reduce greenhouse emissions from human-impacted land ecosystems could reverse the biosphere's current warming role." Fellow co-authors echo the impact of the research results. "This study is an excellent example of science in the service of society," said Jerry Melillo, who serves as chairman of the U.S. National Climate Assessment committee and holds the rank of distinguished scientist at the Marine Biological Laboratory in Woods Hole, Massachusetts. "Its rigorous analysis of the fluxes between the land and the atmosphere of three major heat-trapping gases does two things. It highlights the role of land management across the globe in driving climate change and it identifies land-management actions that can become part of a climate mitigation strategy." "This study is the first-ever global synthesis of emissions and sinks for each region of the globe, and the three main greenhouse gases affecting climate change," said Philippe Ciais, who serves as convening lead author for the fifth assessment report of the Intergovernmental Panel on Climate Change, or IPCC, and associate director of the Laboratoire des Sciences du Climat et de l'Environnement in France. "Its strength is that the greenhouse gas fluxes estimates from ecosystem models are verified by independent atmospheric concentration measurements in atmospheric inversion." Josep Canadell, executive director of the Global Carbon Project in Australia, added, "The results are a big wake-up call for the global climate community that show the way we are managing our lands is not sustainable and not consistent with stabilizing the climate at low temperature scenarios. How we manage the global lands needs to become a central part in our strategy to mitigate global warming." The article is available on the Nature website, http://www.nature.com/. More information about Auburn University's International Center for Climate and Global Change Research is available online at http://wp.auburn.edu/cgc. AUBURN UNIVERSITY -- Auburn University will launch its new “This is Research: Faculty Symposium 2015” Sept. 30 at The Hotel at Auburn University and Dixon Conference Center to recognize research excellence of Auburn and Auburn Montgomery faculty. The event is also designed to provide a forum for collaboration, offer information about support offices on campus and increase the visibility of Auburn research to external constituencies, such as advisory board members, representatives from industry and foundations as well as community members. Three-minute, morning lightning presentations will cover cyber, energy, health disparities, military-related research, SENCER, applied design, STEM education, climate-earth systems, digital applications, fMRI research, nano-bio research, omics and informatics, data management and visual and literary arts. A morning research expo will provide information about key research support offices on campus. The “This is Research: Faculty Symposium 2015” is one of two This is Research symposia scheduled this school year. A spring event, “This is Research: Student Symposium 2016,” will be held in April in the Student Center. The two symposia replace the former Research Week which concurrently showcased faculty and student research. Auburn University President Jay Gogue has signed a memorandum of understanding with Youngsoo Lee, president of KITECH, to formalize the joint research efforts of Auburn's faculty and labs with local companies supported by KITECH. The Korea Institute of Technology, or KITECH, recently documented collaboration in research and technology development with Auburn University to support the Korean automotive industry. Established in 1989, KITECH is a government funded research and development institute headquartered in Cheonan, South Korea, with several research centers in Korea, as well as international cooperation centers in China, Vietnam, Indonesia, Germany and Santa Clara, California. "This signing creates a portal for Auburn University that facilitates our collaboration with the local automotive industry, the parent companies in Korea and the Korean government," said Andy Gillespie, Auburn University assistant provost for international programs. "Our King Sejong Institute, in partnership with Keimyung University, is our cultural bridge to Alabama's Korean and American communities, and our new relationship with KITECH will become our technical bridge, building on recent efforts by a number of Auburn's colleges and offices." Other visitors present at the signing were Byung-Wook Choi, director of the KITECH USA Technology Cooperation Center; Sangkug Lee, director of the International Cooperation Department; Minjin Kim, researcher for the KITECH USA Technology Cooperation Center; and SangWoo Lee, administrator in the International Cooperation Department. In 2014, the Office of University Outreach held a workshop for local companies supported by KITECH. With this declaration of a commitment to joint research, the Office of the Vice President for Research and Economic Development continue this collaboration with its involvement. "There are over 60 Korean companies along the I85 Corridor between Montgomery and West Point, Georgia," said Larry Fillmer, executive director of the Department of External Engagement and Support. "This MOU provides a framework for collaboration among KITECH subject matter experts and Auburn faculty and researchers." Throughout the last five years, Samuel Ginn College of Engineering professor Song-Yul 'Ben' Choe has been working with the Office of International Programs and KITECH to establish a regional office in Auburn for joint research and development efforts for the Korean automotive industry. "Through supporting agreements, research projects, technical assistance, facilities and labs at Auburn may be shared to provide operational and manufacturing solutions to problems being encountered by Korean companies in our immediate region," said Fillmer. "In the future, KITECH may seek to establish an office and operations in the Auburn University Research Park."